The winter doldrums, that is. So far this season, the weather in Spain has been terrific, better than last year, so it has been great to escape the British winter. There have always been some butterflies around – more than the flight seasons in the books would have had me believe – and, until very recently I’ve seen Common Darters (Sympetrum striolatum). The latter will soon die out, though, and it will be late March until the new dragonfly season begins in Spain – a similar date to the UK. Nonetheless, even with the handful of critters for entertainment I do have difficulties keeping my spirits up during winter, though the walks in the mountains certainly help. Today marked something of an upturn, though. We decided to revisit the mountain/hill behind Senija, largely in search of orchids; there’s a patch we know of about half way up. The path up the lower slopes was strewn with scrub which had been cut from the bushes at the side. There’s been a lot of that on walking routes, recently. Someone suggested that this might be as a fire break but I think not. To create a fire break the cuttings would need to be tidied up. As it had been left, it would now form very effective tinder that any fire would jump across in no time flat. I think it is simply to keep the walking routes open. Still useful, though. Unfortunately, as we approached our known orchid patch the sound of a petrol-driven brushwood cutter became louder. Sure enough a workman was slashing the bushes right where the orchids are and litter was falling over the side of the track that would be home to the patch. More worryingly, his boots were necessarily treading the same ground in order for him to get close enough to the bushes he was targeting. “Bother!”, said Pooh, very crossly, and continued. The top of the mountain was equally a shock. Here, many bushes had been scythed to the ground. Our jaws dropped. Fortunately not everything had been cut and there were still some bushes for the butterflies. Butterflies, of course, can fly away and escape whereas orchids are rather rooted to the spot and their fate. 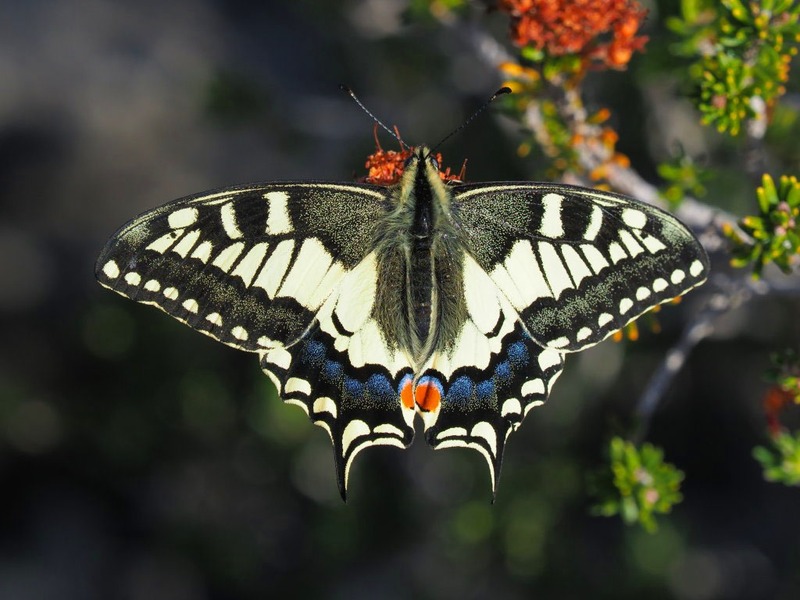 My spirits lifted when I spotted a Swallowtail (Papilio machaon) zoom by. I spotted a second. They were tending to settle on the rock-strewn ground but eventually I did catch one on a bush and on the right side of the light. ground shots are a last resort but now I was happy with what I’d got. The spring species had started. I heard a little yelp and turned to see Francine with her camera pointed downwards. She’d found a consolation prize Dull Ophrys (Ophrys fusca). It looked a rather lonely specimen, slightly nibbled, but was better than nothing given our disappointment on the way up. We probably wouldn’t have seen it had some of the scrub not been cut. There was quite a bit of butterfly activity in the sunshine on the hilltop. The usual winter specimen of Wall Brown (Lasiommata megera) was still there but it had been joined by Some fresh looking Red Admirals (Vanessa atalanta) and I also spotted a Marbled White (Melanargia galathea) flutter by. 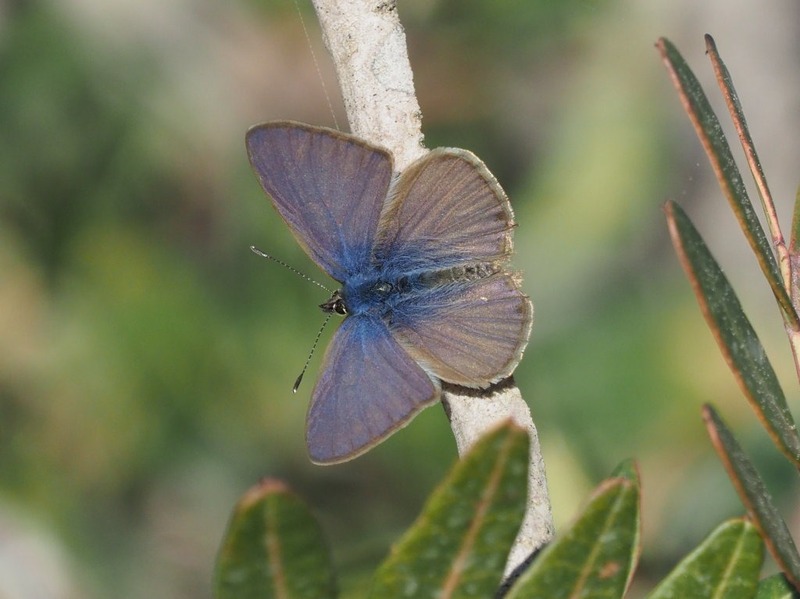 Throughout winter on our mountain walks I’ve been seeing many specimens of the charming little Lang’s Short-tailed Blue (). They were here agian but the m=numbers seemed greater and the activity levels certainly seemed higher. For once, it took me a while to snag a (bad) picture of the underside to confirm the species but oddly I did get a good shot of a topside, which is usually the more tricky subject. The scrub cutter had gone when we made our way back down and Francine was able to get a better look at the orchid ground. 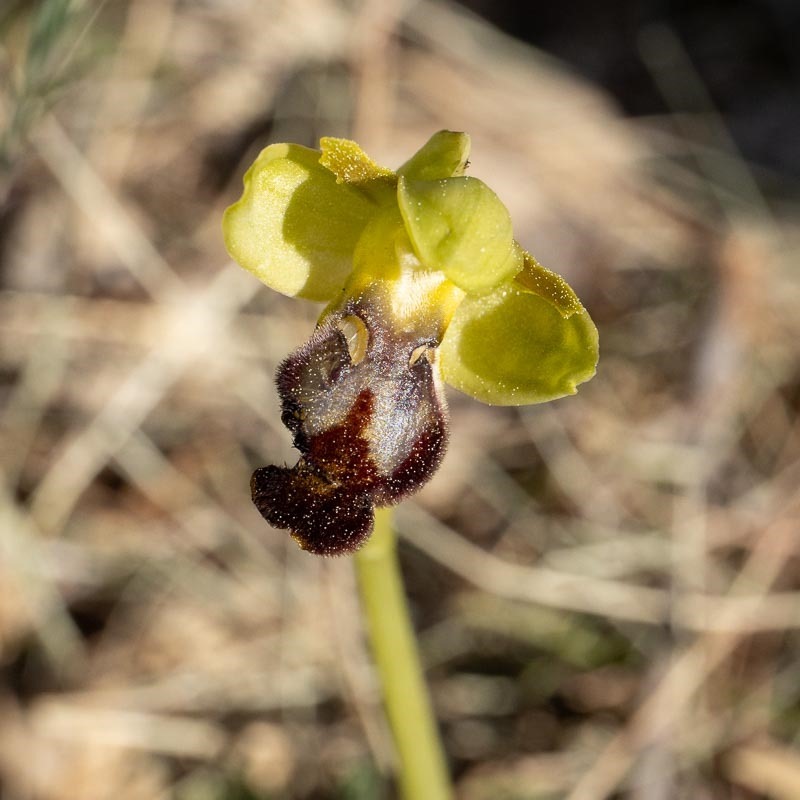 There was certainly a lot a tinder around from the scrub cutting but she did find some rosettes, at least one showing a central spike shooting, so hopefully the orchids will have survived the onslaught. The French are good at mowing down verges that are home to orchids. Sympathetic habitat management is a tricky subject. Preparation for the Summer? Less chance of vegetation catching fire and causing further devastation? On the side, it is warm and dry in the UK now, very spring-like. I’d go with that if they picked up what they cut … but they leave it in the gap. Soon, it’ll be tinder.